I don’t know about you, but I can only get about 500-600 miles out of a pair of shoes on a thru hike…sometimes a bit more depending on terrain. Because of some unfortunate shoe choices on the AT in 2011, I actually went through 7 pairs…which is terrible, not to mention expensive. This broke down in the following lineup: Three pairs of New Balances, a pair of Scott’s (Yep, the ski goggle company make shoes), 2 Pairs of Montrails, a pair of Patagonias (Really…they make shoes, too!). 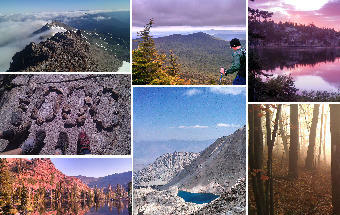 Thankfully, for the following year of thru-hiking (Pacific Crest Trail) it was just 4 pairs. Regardless, replacing shoes on the trail is something that most thru-hikers will probably do on any trail trail over 500 miles. Sometimes, the need for replacement comes a bit earlier than planned (meaning – before you can get to the next town stop or right before the end of a hike). For me, a tear in the upper part/material of the shoe is usually the problem. Currently, we are in Mexico and have had to do a lot of shoe “surgery” as both SweetPea’s shoes and my shoes have taken a beating in the rocky/thorny terrain that we hike in. Since size 13 is not available in any shoe here, I have had to make the one pair last for about four months, and this means that my shoes have needed some TLC, multiple times. In general, we don’t (nor are we suggesting that you try to) squeeze out several hundred miles after making these repairs. 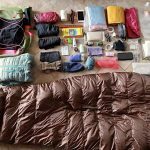 Think of this post as some tips for making it to the next resupply point on a pair of shoes that are starting to break down. This post is about a couple techniques to extend the life of your shoes in the hopes of making it to your next town stop or wherever you will get your next pair of shoes. Below: An ugly, but successful shoe surgery. 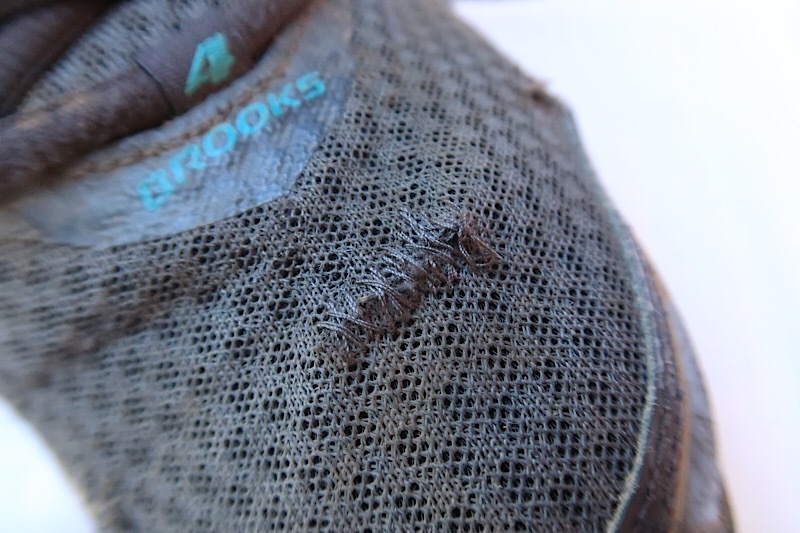 Sewing – When we first see a hole in a shoe, we sew it up with some thread. If you can get some polyester thread – like Gutterman’s – that is ideal. It is hydrophobic and won’t deteriorate when it gets wet. Most types of floss will usually work well too, as long as the floss can be threaded through the eye of your needle. It is best to intervene with sewing before the hole grows too big…definitely before a 1/4” hole forms if possible. The simple hand sewing is not too hard, and can be part of nearly all hikers’ skill set. Start with a piece of thread/floss that is about two feet long. Thread the thread/floss through the needle head. Pull the resulting two ends lengths so they are even. Tie together the thread/floss with an overhand knot about 1” from the loose ends. Tie another overhand knot directly over the first knot, increasing it’s size. Start stitching at least 1/8” away from the edge of the tear. Continue stitching back and forth across, trying to run the needle and thread into the surrounding area that is structurally sound, if possible. Continue about 1/8” beyond the end of the tear. If you have extra thread (more than 3”), you can stitch back over the tear a few times. Once you have only about 3” thread, tie off the end of the stitch by threading the thread through the loop created by the previous stitch. Cut off the extra thread with needle. Super Glue, Crazy Glue or Gorilla Super Glue works surprisingly well. Gorilla Glue is better at gap filling, so if the hole is bigger, use it if possible. You can apply it over the threads of a sewn up hole, or directly over a hole. Gorilla Glue does foam up some and turns yellow as it dries (as in the picture above ‘ugly, but successful), so don’t be surprised if it looks strange once it has dried. Once you have used one of these glues, you will not be able to sew that area if the hole rips open again (or you get another hole nearby) as the surface will be too hard from the glue to insert a needle. For this reason, we recommend sewing first and then putting glue over the surface to give the spot some extra support. Do this in a well ventilated area. Cyanoacrylate adhesives can create some heat and have both visible and non-visible fumes, which you want to avoid inhaling. Protect the inside of the shoe from glue drops – we use a plastic grocery bag. Apply glue thinly and quickly over the tear and to the edge of the surrounding area (1/4” beyond tear). Gorilla Glue is now being sold in really small single use sizes with a screw top. Crazy Glue is sold and packaged in a way where it can be reused, but just be careful that it doesn’t get loose in your pack. How well does this really work? Our experience has been surprisingly good. 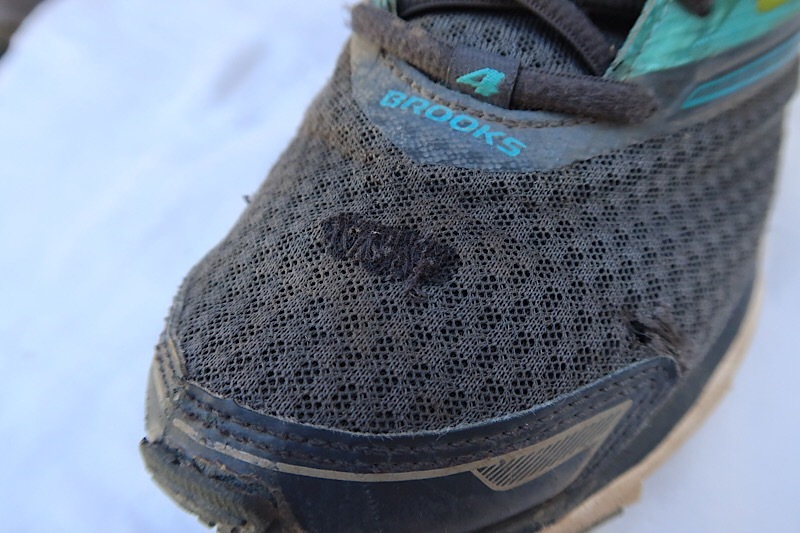 The classic weakness in shoes for me is the bend point right behind the toes, the flex point in all shoes…often this is a mechanical weak spot because of the use of multiple material types in one area: a softer mesh material meeting a harder material like leather or plastic (Brooks Cascadia v9 & v10 suffered terribly from this). 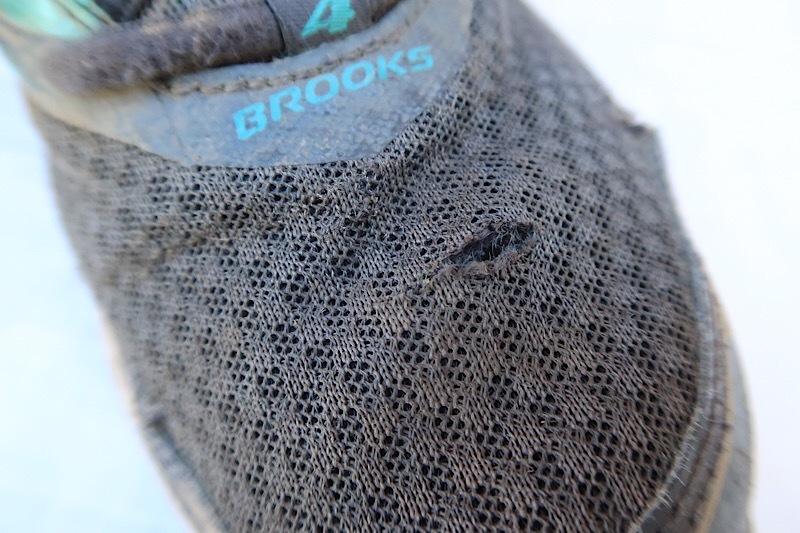 This winter, we both picked up the Brooks Launch running shoe as they were on clearance…sadly, these had the same weak spot as the Cascade v9/v10 and started to rip in the same spot (this is beyond the wear from thorns/rocks). SweetPea sewed the torn areas and we used Gorilla Glue on them. They have held together well, and those tears that I had expected to go from 1/4” to 2” in a week were halted. I was able to keep using the shoes for over 200 more miles. 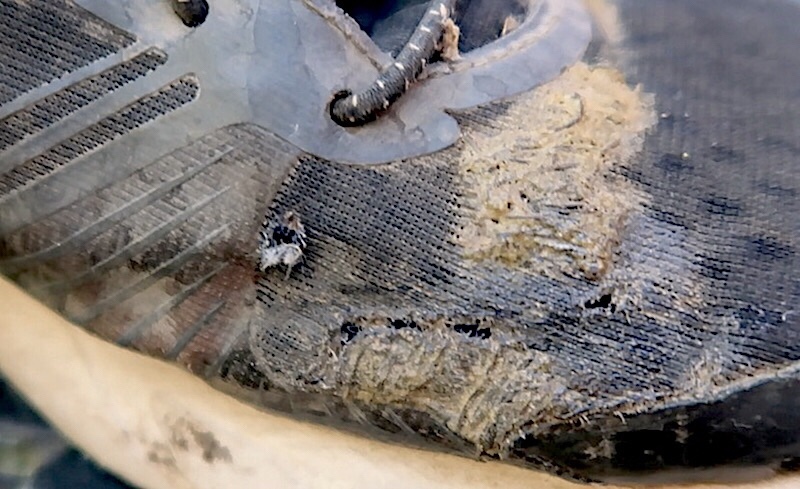 Most long distance hikers I have spoken with get a sense for when a pair of shoes is starting to wear out internally in the shoe. In my experience, when my heels start to hurt that is the shoes telling me that they are worn out – for others, it may be some weird feeling or pain in the arch. This heel pain will usually come after hiking in the shoes for around 500 miles. This seems to be the same when wearing Brooks or Altras for me (doesn’t matter on the model). Regardless of the condition of the shoe’s upper part/material, I try to get a replacement pair of shoes pretty quickly once my heels start hurting. I use aftermarket insoles, first Superfeet and now CurrexSole. From your experience or that of other thru hikers, do you find that upgrading from the standard insole to something more substantial extends the useful life, comfort-wise, of a pair of trail runners? 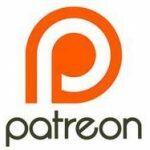 Hi Gerry, thanks for reading the post and commenting. We don’t feel that we get any extra life out of our shoes by using to more substantial footbeds. Unfortunately. We both wear custom footbeds. Sadly, our shoes break down in other places than what could be helped with a better footbed. 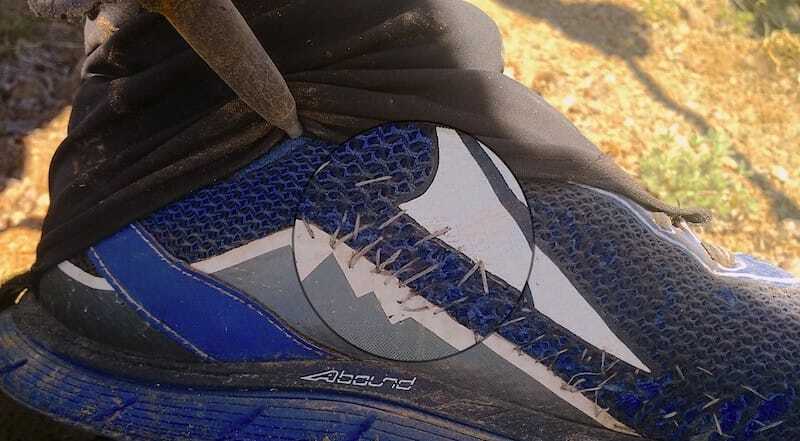 Either the upper rips so much that we are getting sand, rocks and dirt in the shoe too much or the tread starts ripping off in too many places. The one comfort change that will force me to change shoes is in the heel. When that part of the shoe breaks down, I start to feel pain there regularly that pain is in the upper heal or lower Achilles and unfortunately not affected by a good footbeds. At about 400 to 500 miles, this usually starts.